The design of teaching often integrates different theories of learning. Communities of practice are one of the ways in which experiential learning, social constructivism, and connectivism can be combined, illustrating the limitations of trying to rigidly classify learning theories. Practice tends to be more complex. 4.6.2 What are communities of practice? The basic premise behind communities of practice is simple: we all learn in everyday life from the communities in which we find ourselves. Communities of practice are everywhere. Nearly everyone belongs to some community of practice, whether it is through our working colleagues or associates, our profession or trade, or our leisure interests, such as a book club. Wenger (2000) argues that a community of practice is different from a community of interest or a geographical community in that it involves a shared practice: ways of doing things that are shared to some significant extent among members. practice: members of a community of practice are practitioners; what they do informs their participation in the community; and what they learn from the community affects what they do. …communities of practice affect performance..[This] is important in part because of their potential to overcome the inherent problems of a slow-moving traditional hierarchy in a fast-moving virtual economy. Communities also appear to be an effective way for organizations to handle unstructured problems and to share knowledge outside of the traditional structural boundaries. In addition, the community concept is acknowledged to be a means of developing and maintaining long-term organizational memory. Brown and Duguid (2000) describe a community of practice developed around the Xerox customer service representatives who repaired the machines in the field. The Xerox reps began exchanging tips and tricks over informal meetings at breakfast or lunch and eventually Xerox saw the value of these interactions and created the Eureka project to allow these interactions to be shared across the global network of representatives. The Eureka database has been estimated to have saved the corporation $100 million. Companies such as Google and Apple are encouraging communities of practice through the sharing of knowledge across their many specialist staff. Most communities of practice have no formal design and tend to be self-organising systems. They have a natural life cycle, and come to an end when they no longer serve the needs of the community. However, there is now a body of theory and research that has identified actions that can help sustain and improve the effectiveness of communities of practice. Ensure that the community can evolve and shift in focus to meet the interests of the participants without moving too far from the common domain of interest. Encourage the introduction and discussion of new perspectives that come or are brought in from outside the community of practice. from the ‘core’ (most active members), from those who participate regularly but do not take a leading role in active contributions, and from those (likely the majority) who are on the periphery of the community but may become more active participants if the activities or discussions start to engage them more fully. 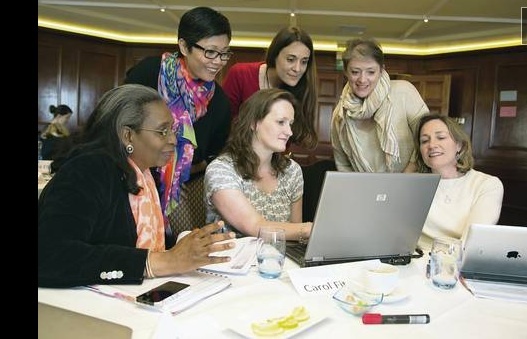 Communities of practice are strengthened if they encourage individual or group activities that are more personal or private as well as the more public general discussions; for instance, individuals may decide to blog about their activities, or a small group in an online community that live or work close together may also decide to meet informally on a face-to-face basis. Attempts should be made explicitly to identify, through feedback and discussion, the contributions that the community most values. by focusing both on shared, common concerns and perspectives, but also by introducing radical or challenging perspectives for discussion or action. There needs to be a regular schedule of activities or focal points that bring participants together on a regular basis, within the constraints of participants’ time and interests. able and willing to collaborate. EDUCAUSE has developed a step-by-step guide for designing and cultivating communities of practice in higher education (Cambridge, Kaplan and Suter, 2005). Lastly, research on other related sectors, such as collaborative learning or MOOCs, can inform the design and development of communities of practice. For instance, communities of practice need to balance between structure and chaos: too much structure and many participants are likely to feel constrained in what they need to discuss; too little structure and participants can quickly lose interest or become overwhelmed. Many of the other findings about group and online behaviour, such as the need to respect others, observing online etiquette, and preventing certain individuals from dominating the discussion, are all likely to apply. However, because many communities of practice are by definition self-regulating, establishing rules of conduct and even more so enforcing them is really a responsibility of the participants themselves. Communities of practice are a powerful manifestation of informal learning. They generally evolve naturally to address commonly shared interests and problems. By their nature, they tend to exist outside formal educational organisations. Participants are not usually looking for formal qualifications, but to address issues in their life and to be better at what they do. Furthermore, communities of practice are not dependent on any particular medium; participants may meet face-to-face socially or at work, or they can participate in online or virtual communities of practice. It should be noted that communities of practice can be very effective in a digital world, where the working context is volatile, complex, uncertain and ambiguous. A large part of the lifelong learning market will become occupied by communities of practice and self-learning, through collaborative learning, sharing of knowledge and experience, and crowd-sourcing new ideas and development. Such informal learning provision will be particularly valuable for non-governmental or charitable organizations, such as the Red Cross, Greenpeace or UNICEF, or local government, looking for ways to engage communities in their areas of operation. These communities of learners will be open and free, and hence will provide a competitive alternative to the high priced lifelong learning programs being offered by research universities. This will put pressure on universities and colleges to provide more flexible arrangements for recognition of informal learning, in order to hold on to their current monopoly of post-secondary accreditation. One of the significant developments in recent years has been the use of massive open online courses (MOOCs) for developing online communities of practice. MOOCs are discussed in more detail in Chapter 6, but it is worth discussing here the connection between MOOCs and communities of practice. The more instructionist xMOOCs are not really developed as communities of practice, because they use mainly a transmissive pedagogy, from experts to those considered less expert. In comparison, connectivist MOOCs are an ideal way to bring together specialists scattered around the world to focus on a common interest or domain. Connectivist MOOCs are much closer to being virtual communities of practice, in that they put much more emphasis on sharing knowledge between more or less equal participants. However, current connectivist MOOCs do not always incorporate what research indicates are best practices for developing communities of practice, and those wanting to establish a virtual community of practice at the moment need some kind of MOOC provider to get them started and give them access to the necessary MOOC software. Although communities of practice are likely to become more rather than less important in a digital age, it is probably a mistake to think of them as a replacement for traditional forms of education. There is no single, ‘right’ approach to the design of teaching. Different groups have different needs. Communities of practice are more of an alternative for certain kinds of learners, such as lifelong learners, and are likely to work best when participants already have some domain knowledge and can contribute personally and in a constructive manner – which suggests the need for at least some form of prior general education or training for those participating in effective communities of practice. In conclusion, it is clear is that in an increasingly volatile, uncertain, complex, and ambiguous world, and given the openness of the Internet, the social media tools now available, and the need for sharing of knowledge on a global scale, virtual communities of practice will become even more common and important. Smart educators and trainers will look to see how they can harness the strength of this design model, particularly for lifelong learning. However, merely lumping together large numbers of people with a common interest is unlikely to lead to effective learning. Attention needs to be paid to those design principles that lead to effective communities of practice. 1. 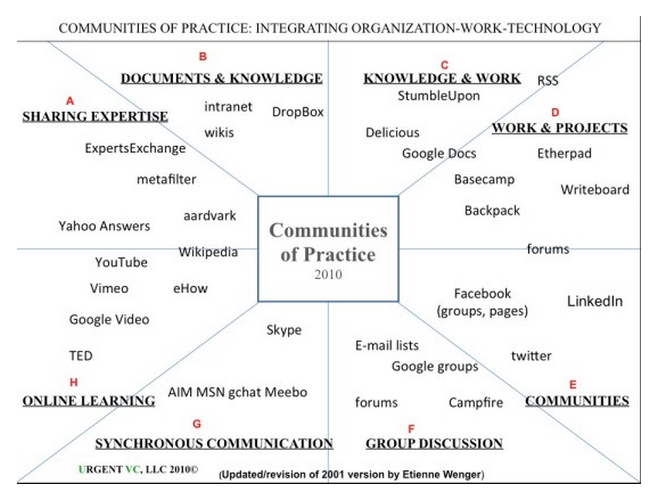 Can you identify a community of practice to which you belong? Is it successful and does it meet the key design principles outlined above? 2. Could you think of a way to develop a community of practice that would support your work as a teacher? 3. Is there anything special you would need to do to make an online community of practice succeed that would not be necessary in a face-to-face community? Brown, J. and Duguid, P. (2000) Balancing act: How to capture knowledge without killing it Harvard Business Review. Wenger, E, McDermott, R., and Snyder, W. (2002). Cultivating Communities of Practice (Hardcover). Harvard Business Press; 1 edition. This document presents a conceptual foundation for promoting and assessing value creation in communities and networks. By value creation we mean the value of the learning enabled by community involvement and networking. 4.6 Communities of practice by Anthony William (Tony) Bates is licensed under a Creative Commons Attribution-NonCommercial 4.0 International License, except where otherwise noted.